Many gardeners dry or freeze herbs from their herb garden so that they'll be able to enjoy their fresh herbs long after peak season. 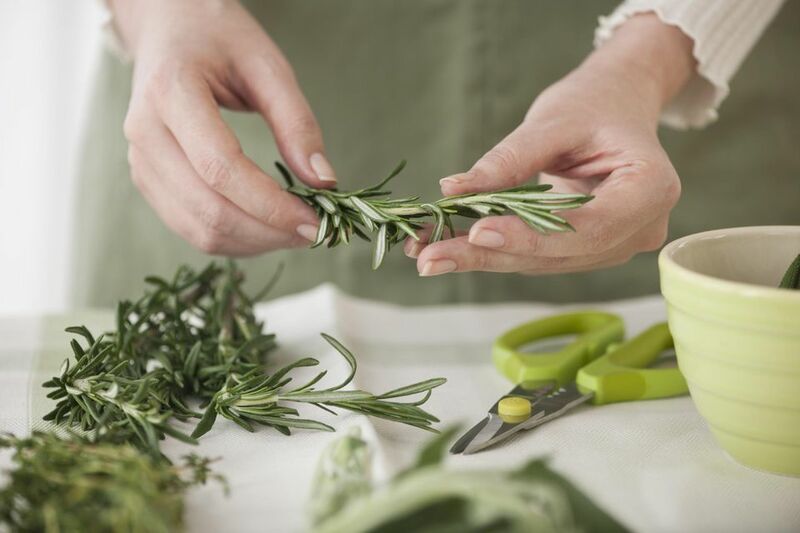 Drying herbs is an easy, efficient means to preserve fresh herbs, but herbs with a high water content seem to rot or get moldy before they ever dry. To preserve herbs with a lot of water in their leaves, like basil, chives, lemon balm, mint, and tarragon, fresh freezing is a better option. The herbs will become limp in the process, but their essential oils will be preserved and their flavor will be intact. When frozen herbs can keep their fresh flavor for several months. Unlike dried herbs, where the flavor gets more concentrated when drying, frozen herbs can be used in the same proportion as fresh herbs. Always harvest the freshest, healthiest leaves. The flavor of herbs is most intense in the morning when the plants are still well hydrated. Avoid using dried or chewed leaves and the older leaves at the very bottom of the plant. Shake off any soil clinging to the leaves and wash the leaves if necessary. Then pat dry with paper towels. Because you are freezing the leaves, having them absolutely dry is not essential, but too much excess water will form ice crystals. Spread the individual leaves on a small tray or cookie sheet. Freezing the leaves flat and individually will prevent them from freezing together into a brick. If you can't find room in your freezer for a large cookie tray, do them in smaller batches or use plates and stack them one on top of another. This is just a temporary step. They won't take up this much room in your freezer all winter. Cover and place the tray of leaves in the freezer. You can use plastic wrap, waxed paper, or whatever you have handy. The cover is just to keep the leaves clean and to prevent them from falling off the tray if it gets jiggled. When the leaves are frozen solid, remove them from the tray, place them in airtight containers and return to the freezer. Once frozen individually, the leaves will not meld together, so you no longer need to keep them spread out. Be sure to label each container. Herbs can look a lot alike in the freezer. Harvest only the freshest, healthiest leaves. As I mentioned above, avoid using leaves that are past their prime. The decline in the flavor of older or declining leaves is not worth the effort of freezing them. Shake off any clinging soil and wash, if necessary, then pat dry with paper towels. Since you're going to be freezing the herbs in water, the only reason for patting them dry is to keep them from making a mess on the counter. You can freeze the leaves whole or chop them beforehand. Once they are frozen and thawed, they are too mushy to chop easily. Stuff 2 - 3 individual leaves or a spoonful of chopped herbs in ice cube trays. It's okay to be a little rough with them. That just releases their oils, which will get frozen along with the ice cubes. Fill the tray halfway with water. Make sure the leaves are down into the water, as best you can. They will tend to float, but we'll fix that with the next step. Place the half-filled tray in the freezer. Once the ice cubes are pretty much frozen, top off each ice cube with water to fill. The leaves will no longer be able to float and should be completely surrounded by water. Now place the tray back into the freezer to freeze solid. Once the ice cubes are frozen, you can remove them from the tray and store in zip closure bags. Don't forget to label them. They look even more alike as ice cubes than they did as frozen leaves. When you are ready to use your herbs, simply toss the whole ice cube into your favorite stew or dish. To save herbs such as oregano and thyme, learn how to dry and store other garden herbs.